The act of giving feedback is tricky. Doing it right requires confidence, knowledge, effective verbal and non-verbal communication skills and, in most cases, good instincts. Breaking the myth of "constructive criticism"
When is it appropriate to give feedback in a team setting? Good managers can trip themselves up by watering down important feedback. While hanging excuses, modifiers and explanations on feedback might make delivery easier, they do not help in the long run. So steer clear of these 15 mistakes when offering feedback. Providing feedback is probably the most important and difficult part of being a manager. Offering feedback shouldn't require a special occasion. When you create a positive and supportive vibe with employees and co-workers, delivering actionable feedback becomes a natural part of being a resourceful manager. Assessment: How Would You Rate Your Feedback? How well your feedback is received depends on a number of steps executed in the right sequence. Each step in the feedback process builds on the one that came before it. Eliminating barriers first, then bolstering the effectiveness of your message. 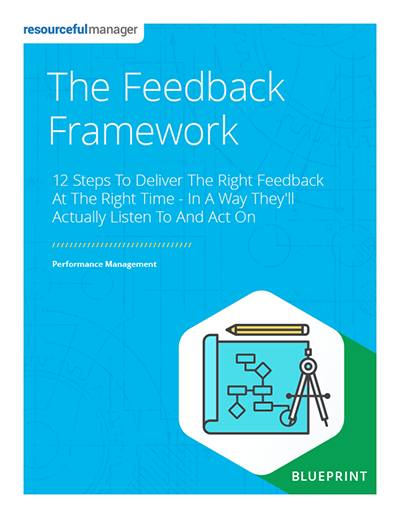 ResourcefulManager's "The Feedback Framework" Blueprint comes with an unconditional, 100% money back guarantee. If you decide "The Feedback Framework" Blueprint doesn't deliver value or simply isn't your cup of tea, just email us at contact@resourcefulmanager.com within 90 days, and we'll process your complete, no-hassle refund in 1 business day or less. Blueprint Extra: Assessment: How Would You Rate Your Feedback?